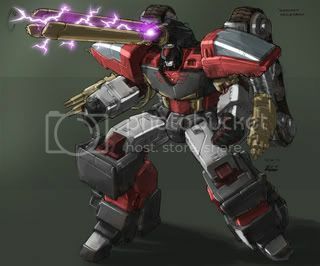 Seibertron.com Energon Pub Forums • I NEED Masterpiece Starscream!!! Yup, all I need to live is water, oxygen, bread, and a Masterpiece Starscream. So, I was wondering if/when Masterpiece Starscream will show up at walmarts again. I have gone to three Walmarts this week and none of them had starscreams. Also, just to make sure, it costs $50 right? Re: I NEED Masterpiece Starscream!!! Show up again? Probably never, sorry looks like your out of luck finding it in a store but there is always eBay. Motto: "You don't need a reason to help someone." I know how you feel. I too literally need a Masterpiece Starscream to live. (Note: I don't mean that literally) I have never found him where I live, though I searched and searched. I guess I will have to buy him on eBay as well. G1Blaster wrote: Damn doctors with their fancy degrees labelling me insane. Honestly, for all the hype surrounding Masterpiece Starscream, I am thoroughly unimpressed by the figure. I've been thinking about this for the past few days, especially since I received Ultimate BB for Christmas and have enjoyed playing around with him since then. Whereas the latter has taken no end of abuse for being overpriced and gimmick-happy, Masterpiece Starscream has gone unscathed since I guess he is "G1 accurate" and the "definitive Starscream". I've heard numerous complaints on this forum about the cheap plastic feel of the entire movie line, but have not seen many similar obsevations for MP SS. Rarely do I feel like I'm going to break any of my TF toys, even with the recent influx of lighter, thinner plastic, but I felt exactly that way with this figure. In fact, after I had transformed him once into plane mode and back to robt, one of the small plastic hinges that holds the piece that hangs off his shoulders(it is part of steps 28 and 29 when transforming into plane) actually crumbled right off! I wasn't forceful with that piece when I had transformed it, it just plain broke off when I took the part off the hinge. Whereas my DVD MP Prime is VERY sturdy, Starscream is almost ridiculously light and cheap feeling. The white paneling that make up the top portion of his plane look chintzy and the whole figure just begs NOT to be touched or transformed. I know it's a Masterpiece figure, but come on, this isn't fine china we're talking about. Masterpiece Starscream cannot stand on his own. Sure you can try, but you'll be worrying about him tipping over with the slightest force of gravity. Why do you think the display stand is there? You need it to hold up the figure because the feet are such laughably cheap plastic that they cannot hold any weight or angle correctly to stand the figure. The fingers on mine also are really loose to the point where I doubt they fall off just by wiggling them a little bit. The fingers are such that you cannot pose them without looking bad since you cannot really align the fingers together symmetrically. This isn't to say that I hate MP SS. I like many aspects of it, but those that I listed are just really too bothersome for me to rate MP SS has barely average, particularly with a $50 price tag. Again, the movie line has taken a lot of guff, but a leader figure like Prime or Brawl, which is $10 cheaper, is FAR more sturdier and better to look at and fiddle with than the overall cheap quality of Starscream. And laugh all you want at Ultimate Bumblebee, but he at least has sophisticated light, sound, and movement electronics that warrant a higher price tag. In short, I'm not telling you not to get MP SS, but unless you're willingly able to put on blinders to the shortcomings of a supposed "masterpiece" figure, prepare to be disappointed with several parts of it. Mine broke on both wing hinges tonight. The same kind of break you see in the photos of Mp-03 with broken wings. I've been extra gentle with those wings too, but I've transformed him quite a few times also. shankz wrote: Mine broke on both wing hinges tonight. The same kind of break you see in the photos of Mp-03 with broken wings. I've been extra gentle with those wings too, but I've transformed him quite a few times also. Shaving some of the plastic off of the hinge piece (the black piece that connects the wings to the body) reduces the stress on the joints. Ouch! I absolutely deem Masterpiece Starscream to be worth it, and if he were a little larger and more durable, I'd regard him as the best all-around Transformer ever made. He's worth getting, just remember he's more of a display piece than a toy. I had to turn to ebay for my MP Starscream. It's ridiculous since the toy is "supposed" to be out in stores. We always lose out to scalpers. As was said before, at least it was only slightly higher priced. I wish people would let the toys at least sit on the shelves for a little while before letting dollar signs take priority over letting people just casually collect cool stuff. Ebay is a blessing and a curse. i have an extra one. why did they cheap out so much on Maserpiece Starscream. Honestly I have one and I love it, but yeah you guys are right, the plastic is cheap, and I was really suprised to see no Diecast when 20th Anniversary Optimus, who is of the SAME SERIES as starscream, has plenty of diecast, is larger, and only cost me like $10 more! Whats the deal anyway? I've had my MP Optimus since 2004 when it came out, and the only thing thats broke on him is the spring that allows his face plate to move up and down, everything else still works fine, his matrix even still ights up. And I've transformed him literally HUNDREDS of times! Why did Starscream get such a raw deal anyway? Anyway hopefully wal-mart will restock. There was only one walmart around here I saw carry them, and i immediatly showed it to my wife and said "THIS IS WHAT I WANT FOR CHRISTMAS!" luckily she grabbed one of them before they were all gone. Only thing you can find at walmart now is a Megatron keychain! 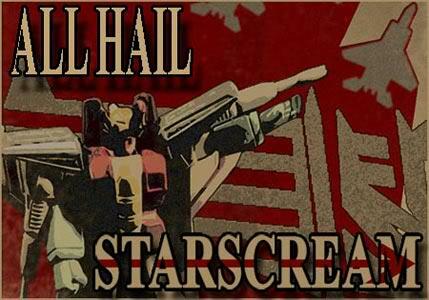 Motto: "All hail Lord Starscream"
I've transformed mine a few times. Not a problem. I love him, I do not feel that his plasic "feels cheap" My husband played with him and said it felt better than some of the figures I've been dragging home. To find him in a walmart at this time will be short of a total Miracle. He was a limited release to some stores. I had someone pick one up for me as I am in Canada--we often miss out on the cool things. Which made my christmas most disappointing, in that respect, as I never saw anything I could buy. Search for him on ebay. It's fairly flooded with figs so you can pick and choose what you want. I'd skip the really expensive buy it now ones. But I would pick it up soon, before his price starts to go up because everyone else is saying "damn, I gotta get him on ebay"
Good luck and when you get him, you'll love him. He's worth it. Starscream's Shrine ~ Fan Art ~Collection~Sunstar's Discord - join today! I had no idea that he breaks easily. Guess I will have to keep the reciept close by if I do find a MP SS. I was browsing the thread again when I remembered something. If anyone has been to a Toys R' Us recently (chances are good holidays or not for us) you may have seen a 12' Batman or Superman figure as a store exclusive. Well, on the back of the boxes for these figures, it's said they were taken from "2-Up" molds which are double sized figures used to ensure the design of the smaller figures that hit the shelves. I don't know if Takara uses this procedure, but if they do, that could explain the quality issues we've had with the MP line. Any design flaws that give us grief might not have occurred in 2-Up version of final product. Of course, this would also mean that Takara has double sized MP molds and figures in a back room somewhere. On mine, the flaw seems to be the fact that the black hinge piece is too wide for that space where the screw slides up and down on the torso. It seems like it was designed for the black hinge to be narrower than that space, and when you fold the wings, the edge on that thing would go down in that space and there would be no breaking stress on the joint (it's hard to explain without visuals, but if you have one take a look and you'll see what I mean, how the edge of that black hinge should go down in that space). It reminds me sort of like how Deluxe Brawl was supposed to have his arms fit in his shoulders, but in reality it didn't work. Anyway, the constant lift on that flat area eventually caused it to crack. The area that I refer to that cracked is the joint that's flat, towards the front of the place, that connects to the black hinge, which connects to the wing. It only makes sense that it would break after seeing what happened. With it broke, I can see whats happening more clearly now. There is a lot of lift happening when you fold the wings. This pisses me off. I went to one Walmart by me and the toy manager said in the computer he was supposed to have 14. He never saw them. A couple of days before me a guy asked the same question and he was given the same answer. But he went the other walmart which is about 10 mins away and bought 5 cases. I'm beginning to think I will never see him at retail. He's not a bad figure; in fact, I recommend him to any collector if you can get him at retail price. I think he looks pretty slick in jet mode and his robot mode is pretty darn G1 accurate. However, when compared to the rest of my collection, Starscream seems about on par with Alternators in overall quality and feel. Yet, SS was going for over 2x the retail price of Alternators. I usually don't like to get into the concept of "value" when it comes to TFs since this is a hobby and dollar worth and intrinsic worth usually don't go hand in hand. But I cannot shake the fact that MP SS simply is not worth the $50 price tag. The only other time I have questioned how much I have spent on a TF with the 60+ TFs I have bought since I started collecting again in July was 20th DVD Prime, and even then, he could have been had cheaper a few months earlier and his overall combination of plastic and die-cast seemed worthy of a heftier price tag. I truly feel sorry for anybody who is paying over retail price for MP SS and because of my experience with him, I'm definitely glad I did not pay the bloated prices for MP Skywarp and Megatron. Oh, by the way, MP SS CAN stand on his own without his display, but you cannot strike many poses due to his feet. I probably would feel a lot better about SS if those feet didn't seem so tacked on as an oversight. I feel the need to defend MP starscream here. Someone mentioned all these problems that i have yet to even notice yet alone experience. Sure mine has the delicate wing hinges and though mine havnt broke there are stress marks so i dont intend on "playing" with him or transforming him that often any more, all my toys are purely for display purposes only anyway as all figures like this should be. I mean its not like these things are designed for little kids to play with as silly as that sounds its the truth. He can also stand on his own, i dont understand why people have trouble standing him up. Mine is very sturdy and pose able, he has no problems standing by his own at all. Theres also no problem with the fingers on mine, they havnt fallen off and are easy to pose with the right touch. Considering Takara never released this character in his proper colors to begin with, and that their upcoming version is going to be double the price for the exact same thing, MP SS is a bargain! Even at current Ebay prices its still a bargain for a show accurate MP Starscream, which IMO is the definitive and most accurate version of the character ever made. Just like MP Megatron you cant get a better looking and show accurate figure than this. Its meant to be a MODEL, not a normal transformer toy intended to be played with and transformed on a daily basis by dirty fingernailed kids. These are only intended for collectors and thus should be treated as a fine and delicate piece. MP SS definitely deserves the title of "masterpiece". No collection is complete without on. does anyone have like a "how to not break MP SS" handbook or something? Like how to prevent wing breakage and overall protection. I haven't even found one yet and I'm worried about breaking it. unicron129 wrote: does anyone have like a "how to not break MP SS" handbook or something? Like how to prevent wing breakage and overall protection. I haven't even found one yet and I'm worried about breaking it. I don't think you really have to fear breaking him. My problem with that small plastic hinge may have just been mine or could affect a whole batch. The fact that not everybody is complaining about it should make you rest easy and just hope you don't get one with any sort of defect or part that is ready to break. I rarely have any problems with "quality control" or missing/easily broken parts when it comes to TFs, so that's why part of me was surprised when it happened with MP SS. It hasn't ruined the figure, it just disappointed me and made me feel that there are some parts of the figure that should have been made with sturdier material. As long as you treat it with care and respect, you really shouldn't have a problem, outside of the plastic hinge-y thing. Only one problem now......where to find an x-acto knife? I had one when I was a kid that I bought at a model shop, but that was many aeons ago. Anybody know if any major chain stores carry those things? well like i said earlier I'm scared to transform him, but I haven't had any problems other than his wing on his right foot continously falling off while I'm transforming him. I'm really glad honestly that I got him for christmas as for the whole city of Indianapolis, I've only seen 3 in the surounding area, and I happen to unwrap one of those 3 before christmas. He truley is an awesome toy, jet mode is awesome. Looks like a model in jet mode, and then robot mode looks straight out of a comic book. 4,960 pages were recently viewed by 518 unique visitors. This page was viewed 1 times on Tuesday, April 23rd 2019 1:40am CDT. © 2019 Seibertron, Inc. DBA Seibertron.com. All Rights Reserved. Established June 2000. Seibertron.com is owned by Ryan Yzquierdo.